PSAC has been actively engaged in discussions with senior government officials regarding the labour shortages that the oil and gas industry has faced and will undoubtedly face again as a recovery in the current low commodity price takes hold. PSAC has assured government that PSAC members remain committed to hiring Canadians first, but that domestic labour markets are not adequate to supply the much needed skilled labour the industry requires. PSAC has tabled recommendations for changes to immigration and foreign worker programs to ease the process of hiring from foreign labour markets. Some of the changes implemented by the federal government in recent months have been influenced by discussions with PSAC and the Alberta Coalition for Action on Labour Shortages (ACALS) with which PSAC has been collaborating. Express Entry – This new program, introduced in January 2015, is an electronic system to manage applications for permanent residence under the following economic immigration programs: Federal Skilled Worker Program; Federal Skilled Trades Program; and Canadian Experience Class. The Express Entry system is the first step to immigrate to Canada under these programs. Potential candidates can complete an Express Entry profile at any time. Anyone who is accepted into the Express Entry pool could get an Invitation to Apply for permanent residence. Rounds of invitations to invite candidates to apply will take place regularly over the course of each year. Visit http://www.cic.gc.ca/english/immigrate/skilled/index.asp for details. Temporary Foreign Worker (TFW) Program – The Temporary Foreign Worker Program (TFWP) assists employers in filling their genuine skill and labour requirements, on a temporary basis, when qualified Canadians and permanent residents are not available. The Program, which is an option of last resort for employers, is legislated through the Immigration and Refugee Protection Act and Regulations and is jointly administered by Employment and Social Development Canada (ESDC) and Citizenship and Immigration Canada (CIC). Visit https://www.canada.ca/en/employment-social-development/services/foreign-workers.html for details. Federal Skilled Worker (FSW) Program – Significantly reduced processing times for applications to 6 – 12 months. The points system used to assess an application is under review and will be reformed to recognize the importance of younger immigrants. Work experience requirement has been reduced to one year from two years. The program will target workers in occupations in high demand. Click here for details. Provincial Nominee Program – Minimum language requirements for low- and medium- skilled nominees came into effect on July 1, 2012, with a focus on direct economic and regional labour market needs, removing family streams in an effort to remove duplication in programs and allow provinces to maximize allowed allocations. Click here for details. PSAC continues to have formative and positive discussions with key government agencies and officials, both federally and provincially, about remaining gaps and obstacles for PSAC members in hiring foreign workers and various opportunities and pilot programs to further enhance labour mobility both domestically and internationally into the oil and gas industry. The provincial and federal governments have joined forces on the Alberta Immigrant Nominee Program (AINP) which helps expedite the processing of an application for permanent residence for valued foreign workers sponsored by their employers. For more information on this program, visit https://www.alberta.ca/ainp.aspx. 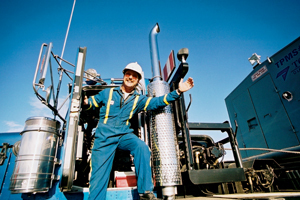 The Jobs in Alberta website is a free service intending to link Alberta employers with foreign skilled workers. Employers must understand the process for hiring foreign workers or they must have a Labour Market Opinion in place to hire foreign workers. The website address is: https://www.alberta.ca/work-in-alberta.aspx. For questions about hiring foreign workers, call the Temporary Foreign Worker Hotline at 1-877-944-9955 (toll free in Alberta). The WCB has published a fact sheet about temporary foreign workers and their coverage. You can download a copy here.